The Sega Saturn Action Replay is a cheat cartridge released as part of the Action Replay series. The original Saturn Action replay stands as the first, and least useful Action Replay cartridge for the Saturn - it is a cartridge which allows users to add cheat codes and modify a game at run-time, and can bypass region locking, allowing for import games to be played. They also have a comms port, allowing them to hook up to a pc to update codes or backup save data. These original Action Replays can be seen as redundant and are not in high demand, having been superseded by the superior Pro Action Replay and Action Replay Plus, which retain all the features seen in this version of the device while adding more. 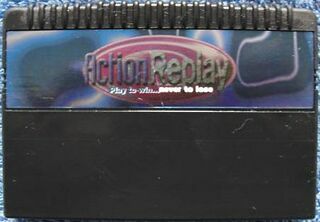 In North America this Action Replay was released by InterAct as the GameShark, and in Germany as the Game Buster. However, aside from branding differences and some replaced text, the cartridges are identical. Some of the earlier versions of the GameShark require holding down buttons , and before starting a game in order to boot imports. Main article: Action Replay (Saturn)/Magazine articles. Main article: Action Replay (Saturn)/Promotional material.